Artist rendering of new USTA tennis complex in Orlando. 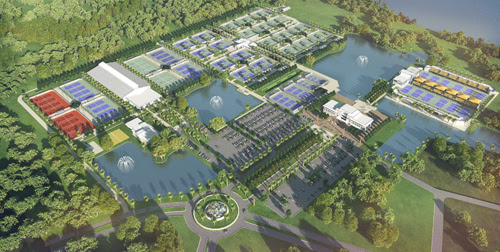 The USTA announced plans to create a state of the art tennis complex in Orlando, Florida. During a press conference, USTA officials unveiled details of the 100-plus tennis court center that will promote player development along with serving as the hub for the University of Central Florida tennis program. In addition to both clay and hard courts, the new complex will offer opportunities for players at all ability levels to improve their game. The new complex is expected to be completed by the end of 2016.